This story’s ending is what earned it the fifth star. What can I say, I’m a bleak guy, and this is a bleak story. Without diving into spoilers, I think this story could have gone one of two ways . . . And Michael Hicks chose the courageous way. He went where the story commanded. And I applaud him! That final chapter - shivers. 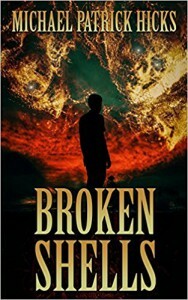 Broken Shells, the upcoming horror novella from Hicks, is a creature feature of the best sort. All kinds of gooshy, nasty bugs are present and accounted for; to make a pun, Hicks preys on the fear of insects. Me, I don’t mind bugs so much . . . But I am very claustrophobic. This story did get me there. A large portion of this story involves the main character being trapped and having to escape; I was on the brink of an anxiety attack while reading. That’s how I know this author did his job. This is a fun, scary read, and it is easily conquerable in a sit or two. Highly recommended! Thanks to Netgalley and the publisher for the ARC.